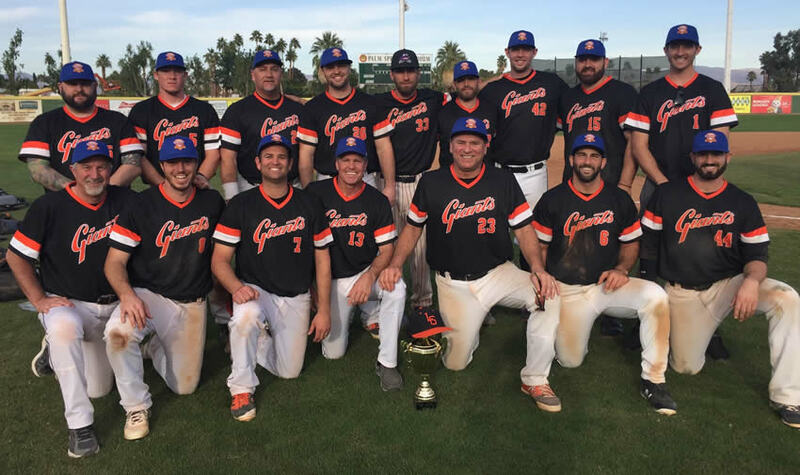 The San José Giants stormed their way thru the 25+ Division of the 2018 MSBL Desert Classic over the weekend with an undefeated 5-0 record. This talented, young core group of good friends has now won the Desert Classic, back-to-back AZ World Series Father-Son American Division championships and was runner-up in the 2017 25+ Labor Day Woodland Hills tournament. The Giants out-scored their opponents 39-14 and racked up 54 hits and 7 HR's during their 5-0 run, and the pitching staff was even better - giving up only 4 earned runs the entire tournament. The weekend started with a tough 6-3 win over the defending champion Brewers as we jumped out early with two 2-run HR's in the top of the 1st inning, and held the good hitting Brewers to only 6 hits. Game 2 was a nail biter as we faced the South Bay Marlins from our home San José MSBL league. Again the Giants jumped out to an early lead, but the Marlins came back in the 3rd inning with six unearned runs on some sloppy defense and three walks. Game was tied at 6's thru six innings when the Giants pushed a run across in the 7th (a Chris Denevi game winner) and held on to win 7-6 behind four innings on one hit, shutout relief from the ageless wonder, 64 yr old Mike Denevi. The Giants hit three HR's in Game 3 to cruise to a 7-1 victory over the SoCal Naturals behind Clay Schmeisser's six hitter. The semi-final game against a very good Twins team saw the Giants fall behind 2-0 and 4-2, but we put together five straight hits and five runs in the bottom of the 5th for a 7-4 lead and never looked back in an 8-4 win. The championship game saw the Giants jump all over the undefeated Royals early and often as we won going away 11-0 behind 17 hits. Every hitter in the Giants line-up had at least one hit. 1B Chris Chambers hit .368 with 6 RBI's, and pitched 5 innings of 2 hit ball in the championship game. Thomas Meals also chipped in with 8 hits and a .410 avg. Pitching staff was led by Jeremiah Struble who went 2-0, threw 15 innings with 15 K's and only gave up 3 earned runs. Matt Jordan threw 7 innings in relief without giving up an earned run, and Art Marmalejo K'd nine in a five inning start in game 2. An outfield of Matt Zuvella (game saving catch in the bottom of the 9th in game 2), Hayden Hibberd and 53 yr old Donnie Chambers played errorless defense the whole weekend, and 1B/OF Jared Jordan and 2B Phil Thrappas also had great tournaments.